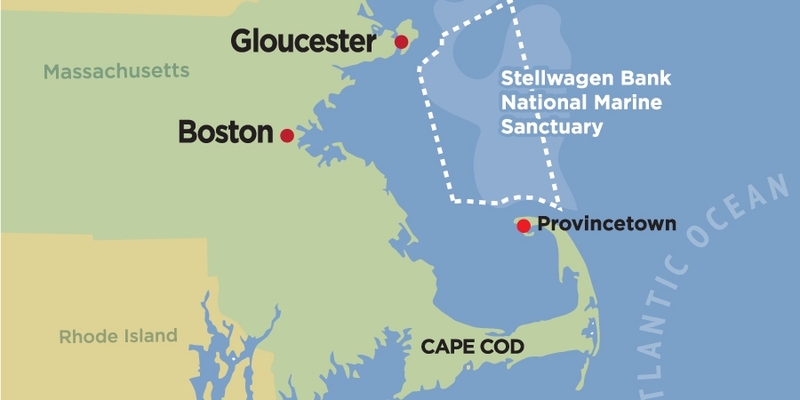 In 1992 Stellwagen Bank National Marine Sanctuary was created off the coast of Massachusetts. It encompasses 842-square-miles of some of the most productive ocean waters anywhere in the northwest Atlantic. While the frequent presence of Humpback whales, Finback whales, Right whales and sometimes other endangered whale species no doubt gives the sanctuary its public appeal and worldwide recognition, this marine sanctuary was created in order to protect all of the great diversity of marine creatures that depend on these waters for all or part of their life cycle. The sanctuary was named after its principal geologic feature: a shallow, underwater sandbar known as “Stellwagen Bank.” There is more to the sanctuary than just Stellwagen Bank, however. The sanctuary encompasses many other equally important areas; most notably “Jeffrey’s Ledge” which is just to the north of Stellwagen Bank itself. You can think of Stellwagen Bank as a huge, underwater sandbar that it is about 24 miles long, 3-5 miles wide at its northern end, and just under 14 miles wide at its southern end. It rises above the surrounding seafloor to a height the equivalent of an 11-story building, with waters on top of the Bank ranging between 65 and 120 feet in depth and surrounding waters being between 250 and 350 feet deep. Visitors to Stellwagen Bank National Marine Sanctuary are usually eager to learn all about the marine animals they encounter while on the water, and learning about the lives of the whales, dolphins, fish, birds, seals, and another marine life that depends on the sanctuary is usually the cornerstone of any whale watch naturalist’s onboard presentation. While this is justifiably so, there are other, often times overlooked aspects of Stellwagen Bank that many nature enthusiasts will find equally as fascinating. Most prominently is the geologic history region. The geology of Stellwagen Bank is critical to the wildlife that lives there. After all, it is the contours of the ocean floor that fundamentally alters the way that water flows through the area. Without Stellwagen Bank, we would have no whales at to watch, and so knowing about what formed the Bank it essential to fully understanding the ecology of the region. It is for this region this page was written. If you are a nature enthusiast and you would like to dive deeper (rim shot) into the geology of Stellwagen Bank and learn some more detailed information about the forces that have shaped this region (and continue to shape and re-shape it today) then this page is for you. 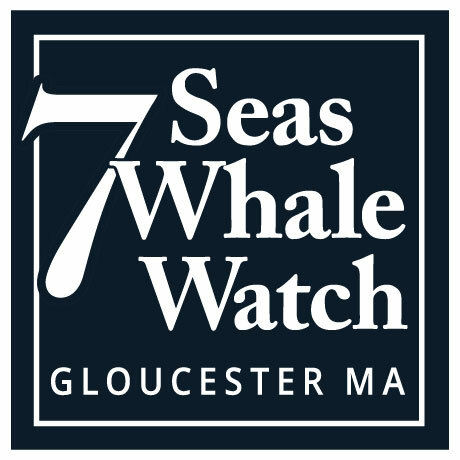 I hope you will enjoy the information here but mostly I hope it will make your visit to Stellwagen Bank National Marine Sanctuary all the more satisfying. To paint a complete picture of what Stellwagen Bank is and how it formed we will need to go on a journey back in time. I suppose to paint an entirely complete picture we could go all the way back to the beginning of the universe some 13.8 billion years ago (maybe even before that… if such a thing exists), but for the sake of saving space on our server’s hard drive let’s pick up the story at the height of the last glacial period (aka “Ice Age” or “Wisconsin Glaciation”… whatever term you prefer) which occurred about 21,000 years ago. This period marked the end of a roughly 100,000 year period in which Earth’s climate was considerably colder than it is today and massive sheets of ice advanced southward, covering the land south to about present-day Long Island, NY in a blanket of frozen water up to 2 miles thick. The map below shows the rough location of these three major ice sheets superimposed over the present-day shape of the land and coast line. As I mentioned earlier, it was at this time (about 21,000 years ago) that the last Ice Age was ending. Earth’s climate was beginning to warm, and as it did these huge ice sheets began melting and retreating northward (actually, the movement of ice is ALWAYS from north to south, but as the climate warmed the rate at which ice was melting at the glacier’s southern end/terminus was faster than rate at which new ice could be formed on the glacier’s northern end, thus the net growth was negative. This gives the appearance of the ice moving north, but they did not actually reverse direction). All three ice sheets did not retreat at equal rates, however. The Buzzard’s Bay Lobe and the Cape Cod Bay Lobe retreated much faster than the larger South Channel Lobe. As a result (and here’s where you have to really use your minds eye) there was left a shallow, swampy depression BETWEEN the present day coast of eastern Massachusetts and the western edge of the South Channel Lobe where Cape Cod Bay/Massachusetts Bay exists today. This area didn’t remain as dry (or swampy) land for long, however, because as the massive South Channel Lobe melted rivers of newly-melted fresh water flowed off of its edges and those rivers that flowed of its western edge quickly filled the depression with fresh water. So if you could travel back in time some 18,000 years you would find a huge freshwater lake in Cape Cod Bay where the ocean is today! Imagine setting sail from Gloucester across a massive (roughly 50-mile-wide) lake until reached a wall if ice (the South Cannel Lobe’s western edge) on its other side! You could haul your boat out onto the ice, go for a long walk across the glacier, hopping over crevasses and rivers of meltwater, until you reached the ocean! The map below attempts to illustrate this period in the history of the region. Please excuse my limited photoshop skills. Note that the barrier between the ocean and the lake (it, along with the melt-water rivers are rendered in darker blue) is getting precariously thin! Also, I should note that the actual coastline was probably somewhat different than it is today, but I didn’t alter it in this image so as to allow for a clearer sense of where the ice and lake was was relative to the present day coast. Something else was happening as the melt-water rivers were filling Massachusetts Bay with fresh water: Stellwagen Bank was being built, pebble-by-pebble and sand grain-by-sand grain. These rivers were carrying with them sand, gravel, and other sediments that had been frozen into the glacial ice and depositing them into the newly forming lake. These sediments accumulated along the western edge of the ice sheet and formed what today we call Cape Cod and Stellwagen Bank. So there you have it: Stellwagen Bank and Cape Cod were formed by rivers of freshwater that resulted from the melting of the South Channel Lobe depositing sediments along the western flank of the melting ice sheet. But the story doesn’t stop there…..
Before long the South Channel Lobe melted enough that it no longer formed a barrier between the freshwater lake to its west and the salty waters of the Atlantic ocean to the east. Thus the ocean inundated the region and altered the ecosystem. It is important to note that at this time sea level was about 300 feet lower than it is today because much of the world’s seawater was still locked-up in the form of glacial ice. So you might think that, with ocean levels being so low, that the newly formed Stellwagen Bank/Cape Cod was exposed land. It wasn’t. They were submerged at this point in their early history. The reason for this is that the weight of the Ice Sheets was so great that the land itself was squashed or depressed. I like this analogy: Imagine you have a big, wet sponge (like the kind you wash a car with) sitting on a table. This sponge represents the land. Now imagine yourself placing your hand on the sponge and leaning on it. You now represent the ice sheet and your weight the weight of the ice on the land. Imagine the sponge getting squished until it is almost flat. When you remove your hand the sponge it remains flat for a moment even after the weight is removed. This is what the land was like shortly after the ice retreated… squashed! It did not spring back right away. Now I think it is easy to understand why the newly formed Stellwagen Bank/Cape Cod were submerged despite the lower sea levels at the time… they were still experiencing the effects of 100,000 years of being squashed under ice! Keep this analogy in mind…. we will return to it later. At this point, you might be wondering how we know all this happened and how we know approximately when it all occurred. Well, we can infer this complex geologic history by examining the remains of microscopic organisms (plankton) found in the sedimentary layers of the ocean floor. Radiocarbon dating shows that freshwater aquatic plankton began to flourish about 20,000 years ago in the Massachusetts Bay area. So this must be when a freshwater lake was formed. Then about 18,000 years ago all of the freshwater organisms abruptly disappear and are replaced by salt water/oceanic organisms! This must be when the ice of the South Channel Lobe melted enough to let ocean water pour into the region. Now let’s get back to the sponge analogy. If you imagine once again your weight squashing the sponge (representing the weight of the ice squashing the land), then you imagine taking your hand away (the ice melting) but the sponge remaining flattened for a moment (which is which is why Stellwagen Bank/Cape Cod were underwater despite the 300-foot-lower sea levels) you might be thinking: “Yeah, but the sponge quickly expands back to its original shape!” You’re right. And similarly, the land also rebounds… in fact, it is sometimes called “isostatic rebound” (there are lots of other terms for it too). So, between 18,000 and 11,000 years ago the land, now free of the crushing weight of the ice, rose. It rose so fast that despite the ever-rising ocean level (from the continued melting of the glaciers) that Stellwagen Bank and Cape Cod rose from the sea and became dry land! At this point, Earth’s climate was still much colder than it is today and so the landscape was not at all like the landscape we see in southern New England at present. There were no broad-leaf, hardwood forests of Maple and Oak (the “Eastern Mixed Forest”). Instead, there was a dry, cold tundra-like grassland dotted with lakes, ponds, and stands of Fir and Spruce trees. It probably closely resembled present-day Siberia! This climate was perfect for the remaining Ice Age Mammals such as Mammoths, Giant Ground Sloths, Dire Wolves, and Saber-toothed Cats. We know this because the remains of these animals (especially the teeth of Mammoths) have been found by fishing boats after dragging their nets through the sediments on Stellwagen Bank. There was another mammal arriving in the area at the time too: humans. The earliest human artifacts in the southern New England area date back to about 13,000 years. I like to imagine what it was like for these earliest human settlers: I imagine standing on a beach, perhaps on present-day Cape Cod where Provincetown is located today. I imagine I’d be wearing a jacket, pants, hat and boots made of Mammoth fur. After all, it’s probably still very cold. There may be Walrus on the beach, maybe whales swimming just offshore. In front of me to the west, beyond a flat plain is a large, grass-covered hill (Stellwagen Bank) where I could see Mammoths grazing. I would probably have a spear (and hopefully a few friends!) close by, not only to help hunt the Mammoths but also to help defend ourselves from any of the Ice Age predators that were also here to hunt. It’s pretty incredible to think about! As the millennia past and ocean levels continued to rise a narrow channel of ocean formed that separated “Stellwagen Bank” from “Cape Cod.” This channel is today called “Little Stellwagen Basin” and can be seen on a nautical chart as a relatively deep-water area (about 150’ feet deep) that separates Cape Cod from the southern end of Stellwagen Bank. So at this point, Stellwagen is now an island just a few miles from shore. I imagine humans would routinely cross Little Stellwagen Basin to visit the island. Most, if not all, of the large animals, are probably gone but the island may be good for farming, or to serve as a protected area from other not-so-friendly humans. Indeed, many human artifacts have also been found buried in sediments of the seafloor on Stellwagen Bank so we know our ancestors were still able to visit the area up until about 8,000 years ago. By about 8,000 years ago the ocean levels rose sufficiently to swallow Stellwagen Bank and so it slipped beneath waves for good (well, at least until the next ice age or some other Earth-altering event occurs). Since that time the Bank has served as a barrier to ocean currents. As currents created by the movement of tides and/or the ever-moving waters of the World Ocean flow through the region they collide with the sides of the Bank and get deflected upwards. As they rise they drag with them nutrients from the ocean floor up to the surface layers of the ocean where the nutrients mix with sunlight and oxygen. This potent mix of sunlight, oxygen, and nutrients from the ocean floor creates just the right conditions for plankton to once again grow. Each year the Stellwagen Bank region experiences massive “blooms” of plankton and it is this tiny, microscopic life that forms the base of the region’s food pyramid; it is the anchor to which the entire food chain is tethered. This massive food pyramid, this robust food chain is what supports all of the marine life in the region…. including the great whales we see. I hope this page has helped to illustrate how many different forces needed to combine together in just the right way to create this unique and productive marine environment. Of course, as I stated at the beginning of this article, we could go back even further than the end of the last Ice Age if we wanted to: Did you know Dinosaurs used to live here too? Or that the bedrock beneath the glacial sediments of Stellwagen Bank show stresses from the birth of the Atlantic Ocean when North America separated from Africa? But that’s another page for another time. I hope you enjoyed this read, and I hope it makes your trip to Stellwagen Bank National Marine Sanctuary even more enjoyable too.